Practice the Daily Current Affairs MCQ - 3rd and 4th December 2017 and get ready to face the upcoming IBPS, SSC exams easily. 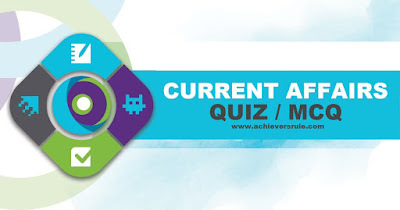 The Current Affairs Set consists of the questions of latest pattern, answers along with explanations that covers all the latest news updates i.e. sports, awards etc. Q1. What is the theme of World AIDS Day ? Q2.Sibi George is appointed as the Ambassador of India to which country ? Q3.Dia Mirza, was appointed as UN Environment's Goodwill Ambassador for India. She is the former _____ . Q4.India has signed an agreement for Naval Cooperation with which country ? Q5.The first Swarna Rajdhani Rake of India is pressed by which Railway zone ? Q6.India has donated 500 tonnes of Rice to _____ ? Q7.External Affairs Minister Sushma Swaraj attended the Shanghai Cooperation Organization summit. The Summit was held in which country ? Q8.What is the theme of Shared Value Summit 2017 held in New Delhi ? Q9.The Hornbill Festival is held in which state of India ? Q10. Who has won a gold medal at the Asian Luge Championships at Altenberg, Germany ? Q11.Which day is celebrated as the International Day for the Abolition of Slavery ? Q12.Which day is celebrated as the International day of persons with disabilities ? Q13.Miss World 2017 Manushi Chhillar is given the Indian of the year special achievement award. She is from which state ? Q14.Which of the following has announced a new Framework to improve Governance for Mutual Funds ? Q15.Which company has launched the Datally App ? Explanation 1. Right to Health is the theme of World AIDS Day 2017 . The World AIDS Day is celebrated on December 1, 2017. Explanation 2. Shri Sibi George, presently Joint Secretary in the Ministry of External Aftairs has been appointed as the next Ambassador of India to Switzerland. He is a IFS officer of 1993 Batch. Explanation 3. Former beauty queen and actress Dia Mirza has been appointed as UN Environment’s Goodwill Ambassador for India. As part of her role, Dia will work on raising awareness of and seeking solutions to environmental issues that the world, and India in particular, faces. Explanation 4. India and Singapore have signed Bilateral Agreement for Navy Cooperation that will allow Indian Navy ships logistical support, including refueling at Singapore’s Changi Naval Base located near disputed South China Sea (SCS). Explanation 5. To improve passenger experience, Ministry of Railways decided to upgrade Premium Rajdhani and Shatabdi trains under Project Swarna. With improved passenger amenities, aesthetics and hygiene standards, Country’s first Swarn Rajdhani (Train no 12313 New Delhi – Sealdah Rajdhani Express) was launched in New Delhi. Explanation 6. India donated 500 metric tonnes of rice to the Kingdom of Lesotho, in Southern Africa, which is facing acute food shortage due to famine. High Commissioner of India to South Africa and Lesotho, Ruchira Kamboj handed over the donation to the government of Lesotho. Explanation 7. External Affairs Minister Sushma Swaraj attended the Shanghai Cooperation Organization summit. The Summit was held at Sochi in Russia. Explanation 8. Equity and Empowerment is the theme of Shared Value Summit 2017 held in New Delhi . The Minister of Industry and Commerce, Suresh Prabhu was the chief guest for the Shared Value Summit 2017 held in New Delhi. Explanation 9. The Hornbill Festival is held in Nagaland. The festival is held every year from 1 - 10 December. Explanation 10. India's veteran Winter Olympian Shiva Keshavan on Friday won a gold medal at the Asian Luge Championships at Altenberg, Germany. The sole Indian participant and defending Asian champion retained his title with a time of 55.60 seconds. Explanation 11. 2nd December is celebrated as the International Day for the Abolition of Slavery. The Day was first celebrated in 1986. Explanation 12. 3rd December is celebrated as the International day of persons with disabilities. The day is celebrated to promote the rights and welfare of disabled individuals around the globe. Explanation 13. Miss World 2017 Manushi Chhillar is given the Indian of the year special achievement award. She is from Haryana. Explanation 14. Capital market regulator Securities And Exchange Board of India or Sebi, prescribed norms for enhancing governance at mutual funds. In the circular, the market regulator prescribed norms on director and auditor rotation. Explanation 15. Google introduced an app designed to help Android smartphone users stay under the limits of pricey mobile data packages in developing countries.